The Allen County-Scottsville Patriot golf team remained perfect on the season in head to head or tri matches this season following a three-stroke win over Franklin-Simpson Tuesday afternoon, September 11, at the Scottsville Country Club. The Patriot finished with a team score of 349 while the Wildcats posted a 352. Patriot junior Owen Stamper led AC-S with a 34. Junior Bryson Bonds posted a 38 with sophomore Peyton Cline recording his lowest nine-hole round of the season (38). Seniors Brett Rippy and Tate Stinson carded rounds of 39. Tyler Ford notched a 40 with Tanner McPeak posting a 41. The Allen County-Scottsville Patriot golf team placed first in the 2018 District tournament Monday, September 10, at the Hidden Hills Country Club in Tompkinsville. The nine-hole tournament includes girls and boys teams representing AC-S, Barren County, Glasgow, and Monroe County---the teams that comprise District 15 in basketball, baseball, and softball. AC-S finished with a team score of 166. Monroe County was second with a 173 followed by Glasgow (183) and Barren County (217). The Patriots were led by junior Owen Stamper who carded a 38 for his round. Stamper finished second individually behind Monroe County’s Trevor Isenburg (37). Patriots golfers Brett Rippy and Bryson Bonds tied for third with rounds of 42. AC-S’s Peyton Cline shot a 44 while Tyler Ford recorded a round of 47. The Lady Patriots placed third in the event with a team score of 207. Alyson Miller paced AC-S with a round of 48. Hannah Beltz followed with a 49. Golfers Amber Wimpee (53) and Emma Cline (57) completed the scoring for AC-S. Monroe County’s Conner Geralds defeated Glasgow’s Abbie Lee in a playoff for top medalist honors. The Allen County-Scottsville Patriot golf team placed seventh among 20 teams entered Saturday, September 8, in the annual Bowling Green Invitational Tournament at the Bowling Green Country Club. The Patriots finished with a team score of 321, the lowest among the six Region 3 golf teams entered in the prestigious event. St. Xavier captured team honors with a 286. Taylor County placed second (298) followed by Ballard (301), Trinity (310), Highlands (317), and Elder (317). Region 3 schools and their scores were Greenwood (324), Bowling Green (325), South Warren (341), Franklin-Simpson (351), and Glasgow (370). Patriot junior Owen Stamper led AC-S with an even-par round of 72, one shot off the pace of individual winner Campbell Kremer from Louisville. Kremer defeated Collier Curd and Andrew Sullivan in a playoff. Stamper finished tied for fourth with Drew Doyle, Robbie Bender, and Jay Nimmo. 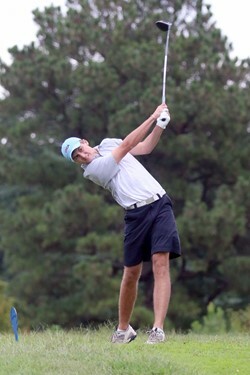 Stamper’s round included three birdies on three par-5 holes, 12 pars, and three bogeys. AC-S senior golfers Tate Stinson and Brett Rippy each posted rounds of 82 to tie for 37th in the field. Stinson recorded a birdie and nine pars on the day. Rippy had a birdie and seven pars. Junior Bryson Bonds carded an 85. Sophomore Peyton Cline struggled with a 103.